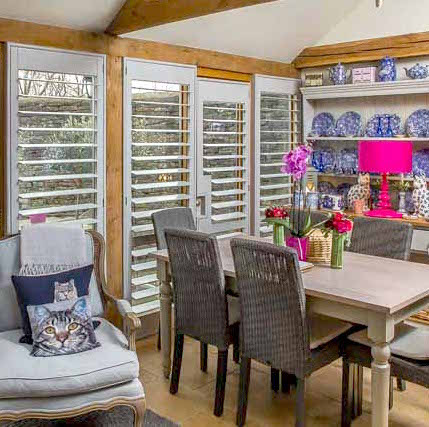 Chippenham Plantation Shutters by Just Shutters – giving you quality with our range, value with our service and peace of mind with our lifetime guarantee. Call us for window shutters Chippenham on 01225 302599 and let us help you further. The historic market town of Chippenham combines old traditional architecture and Great British character with the vibrancy and growth of a modern town. Chippenham boasts a thriving community with diverse dwellings from the near ancient to the brand new, and we at Just Shutters have the perfect style and finish to suit your home whatever its age or type – and of course a delicate touch. Whether you live in a traditional cottage, a modern apartment, a contemporary house or a Medieval manor, our years of experience to ensure your home will be treated like a castle! Your local specialist is Rob Cole (pictured). Rob is a shutter expert with an unrivalled eye for detail and a thorough nature that creates the perfect shutter solution for customers; every time! Rob has been MD of your local Just Shutters for many years and has earned an unsurpassed reputation for quality and service. With the widest range of styles, materials, finishes and louvre sizes, we have the perfect solution for your home whatever your style and taste. Shutters are ALL we do, meaning we are the experts, the specialists in the field, passionate about our product, quality and service. Plantation Shutters are built to last, strong, hardwearing and durable they come with a lifetime guarantee. Value – shutters provide added value for money year on year; Curtains may need laundering, fade and mildew, or go out of fashion. Blinds may tangle or warp. Shutters however, provide you with peace of mind year after year with our life time warranty – while remaining low maintenance and always in style. Call for more information or free home visit in which our shutter designer will show you samples in your windows and give you a personalised quotation. Call 01225 302599 request a brochure or book an appointment now. We can tell you all about ourselves and the promises we make, but we would rather have others tell you how we have kept them! Here is what a few of our many thousand satisfied customers had to say. As a result of reviews like these, we have received a 9.9/10 rating on Checkatrade! “So pleased with my new shutters. Thought they would be out of my price range but they were very reasonable. First class service from start to finish. Highly recommend. “Excellent service, friendly and responsive task. Installation quick and mess free. Will use again. If you like window shutters Chippenham, you may also like to see: Shutters Bath, Shutters Bradford on Avon, Shutters Trowbridge, Shutters Frome, or Shutters Wells.